Archives : MARKET REBOUNDS ON POSITIVE GLOBAL CUES - 07/09/2012. MARKET REBOUNDS ON POSITIVE GLOBAL CUES – 07/09/2012. RISING GAP ACTS AS SUPPORT. Market took support at the gap mentioned last week and rebounded from there. The Pull-back was possible due to the bullish global markets. Both the indices registered a bullish reversal candlestick pattern on Thursday and the bullishness lasted throughout Friday. In the process the market has regained the short term average and as a result the short term trend has turned up. Sensex opened the week at 17465, made a high of 17701, low of 17250 and closed the week at 17683. Thus it registered a weekly gain of 303 points. At the same time the Nifty opened the week at 5276, made a high of 5347, low of 5215 and closed the week at 5342. Thus the Nifty went up by 84 points on a weekly basis. Sensex on Thursday completed a Bullish Harami pattern and Nifty on Thursday formed a Bullish Belt Hold pattern. The confirmation of Bullish reversal was given on Friday when an Opening White Marubuzo was formed after a big gap-up opening. On the weekly charts both Sensex and Nifty have formed a Bullish Harami pattern which requires a confirmation in the form of a white body candle for the next week. Friday saw a big gap up opening after which the market has left behind one more Bullish Rising Gap between Sensex 17418-17575 and Nifty 5260-5309. This gap is likely to act as support. Last week too the market has taken support at the Bullish Gap between Sensex 17208-17313 and Nifty 5220-5260. Currently both Sensex and Nifty are undergoing a correction of the upward rise and this correction will be completed when Sensex starts trading above 17696 and Nifty above 5360. This week both Sensex and Nifty have regained the short term average of 20dma (Sensex – 17604 and Nifty – 5330) and has bounced back after taking support at the 50dma (Sensex – 17388 and Nifty – 5271). At the same time both the indices continue to remain above the long term average of 200dma (Sensex – 16958 and Nifty – 5133). Thus the trend in the short term timeframe has turned bullish while the trend in the medium term and long term timeframe continues to remain up. Market is now well above the level of the Falling Channel Top which comes in at Sensex 15651 and Nifty 4739. These levels should now provide Support for the market. The overall bullish long term target for Falling Channel pattern breakout remains intact. The targets as per this formation are Sensex 20383 and Nifty 6148. MACD continues in Sell mode even while remaining in the positive zone. The ROC too continues in Sell mode and is in negative zone. RSI (55) has gone above the equilibrium line and has given a fresh Buy. Stochastic Oscillator %K (22) is in Buy mode as %K is above %D. MFI continues in Sell mode as it is at 33. The Directional Indicators have signaled a fresh Buy on Friday when +DI went above -DI. ADX has fallen to 17 which suggest that the market is once again not having a clear trend. OBV is showing sideways movement. The Nifty O.I. PCR has fallen to 1.06. For the September series, highest open interest buildup is seen at 5200 Put and 5600 Call. This suggests an overall range of 5200 on the lower side and 5600 on the higher side. 5300 strike has seen strong Put writing on Friday which suggests strong support near those levels in the short term. 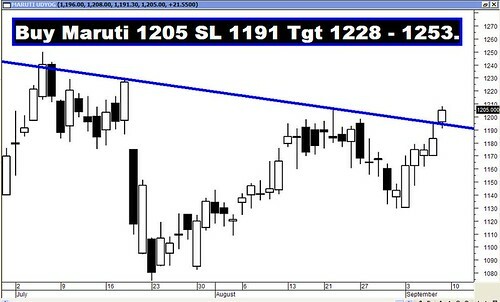 Trendline Resistance for the Sensex is at 17918. The Trendline Support for the Sensex is at 17279. Trendline Resistance for the Nifty is at 5431. The Trendline Support for the Nifty falls at 5236. For the week ahead, Sensex will find Support at 17418-17129-16815 and will find Resistance at 17972-18234-18523. For the week ahead, Nifty will find Support at 5260-5189-5095 and will find Resistance at 5448-5542-5629.